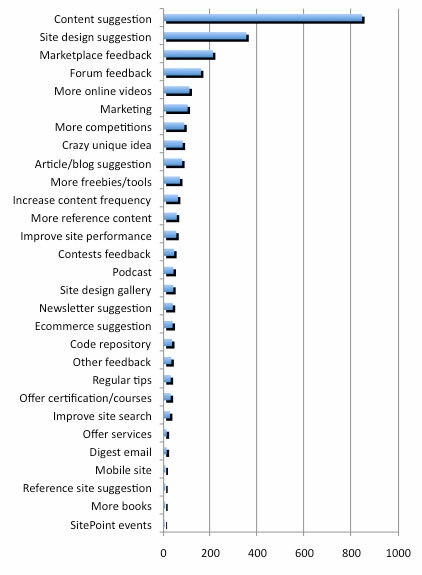 We recently ran a survey that asked, among other things, how we could improve sitepoint.com for our readers. The survey elicited just shy of 5,000 responses, and as the main person responsible for creating and running the survey, the task fell to me to read through and categorize every single suggestion. This was obviously an enormous job, but it was also an incredibly illuminating exercise to read so many thoughtful and exciting ideas for how we can make the SitePoint of the future even better (a lot of the motivation for people coming up with so many great ideas was no doubt related to the awesome prize that was on offer). Some of these categories sound a bit generic and warrant further breakdown, which is something I’ll do in a later post. There were also some ideas that were difficult to categorize — “out of the box” suggestions that didn’t fit into any particular category — which I’ve classified as “Crazy unique idea”. It’s this group of ideas that contained the majority of the contenders that were shortlisted to win the prize. As you can see, some of the most common requests are for specific content (more about that in my next post) and changes to the site’s design (in particular, a more “modern” look, a less cluttered front page, and the ability to customize the site to your preferences). We at SitePoint HQ agree that these are all important, and these items are all high priorities for us. Having said that, we can’t implement everything that has been suggested. However, I will tell you that we have taken every suggestion into consideration, and there are some very exciting things happening in the coming months. Suffice to say that we now have a much larger list of tasks ahead of us — but please be patient as we can’t implement everything at once. One of the categories that I haven’t included above is the “you guys are awesome, don’t change a thing” response. It was a huge ego boost to read so much praise and positive encouragement from our readers. Aside from the forums, blogs and the occasional conference, we don’t get that many opportunities to speak directly to our readers and customers. So hearing so much positive feedback, especially when we were only trying to solicit feedback on what we could be doing better, was just terrific. Finally, if you run your own site and have a sizeable community, I urge you to conduct a reader survey. The feedback is invaluable for shaping the future direction of your site.